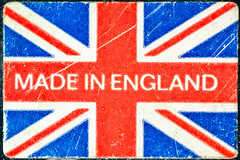 Made in England by Daniel Kulinski, on Flickr. The reason the Westminster politicians aren’t offering you Devo Max at the moment is because they think they’ll win without doing anything. However, if the Yes side manages to close the gap later in the year, Westminster will suddenly offer Devo Max or whatever it takes to preserve the Union. Because Kakha had already watched another Union — the Soviet one — implode from the inside, I thought this was a sound piece of advice, so I’ve been watching intently for offers of Home Rule since the recent YouGov poll came out. But no. Nothing. Not a sausage. It’s like they really don’t care. From a Unionist perspective, it does not help that, in general, London has been useless. Even now Westminster seems more interested in the Clacton by-election than in the referendum that will decide the future stability and integrity of the United Kingdom. Viewed from North Britain, this seems desperately petty and small. There is, whether one likes it or not, a sense that perhaps they’re just not that into us. What the Canadians then did to save their country offers plenty of lessons for us now. […] [T]here was another last-minute tactic that the Canadians used, which proved as powerful as any speech. […] [The fisheries minister] found out about a unity rally being held in Montreal, and decided to turn it into a rally with thousands of Canadians flying in to join it. […] And this is what saved the country. The “stay with us” message was delivered by more than 100,000 Canadians. All Scots I’ve suggested it to so far seem to think it would backfire spectacularly. Of course, I might be wrong. Westminster might have something huge up their sleeve. It sounds unlikely, but a friend of mine completed a YouGov survey today asking questions like this: “If the UK gave Scotland control over oil revenues, would you vote No instead of Yes?” Of course it might simply be an academic exercise, but it does sound a bit like Westminster is searching frantically for a panic button to press next week if Yes is suddenly in the lead in the polls. Personally, I think it’s too late. No matter what they suggest now, most voters are likely to dismiss it as a last-minute stunt. Future history books will most likely discuss the outrageous complacency displayed by Westminster, the way London-centric politicians spent their time rearranging their deckchairs while Scotland was busy building up the confidence to vote Yes. I believe independence will be great for Scotland and ultimately good for the rUK too, but it will almost certainly be a disaster for the Westminster elite. It’s hard to understand why they’re just shrugging their shoulders instead of doing everything they can to protect their cosy wee world. We’re witnessing the strange death of Great Britain. The strange death of Great Britain. http://t.co/w5zDzmTNHq #IndyRef #VoteYES! RT @Jintyg51: The strange death of Great Britain. http://t.co/w5zDzmTNHq #IndyRef #VoteYES!